Singlet oxygen is the common name of an electronically excited state of molecular oxygen which is less stable than molecular oxygen in the electronic ground state. It is typically generated via energy transfer from the excited state of a photosensitizer to the oxygen molecule. The reactive properties of singlet oxygen are, for example, used to destroy cancer cells in photodynamic therapy. In order to optimize such therapies, current research tries to design photosensitizer molecules that optimize the generation of singlet oxygen. Other studies focus on the emission lifetime of singlet oxygen, which is solvent dependent and can therefore be used to gain information about the environment of the emitting oxygen molecules. Singlet oxygen studies are usually performed by steady-state and time-resolved phosphorescence measurements with emission detection around 1270 nm. Such measurements are usually challenging, because the singlet oxygen emission is very weak compared to, e.g., the fluorescence signal of the photosensitizer. 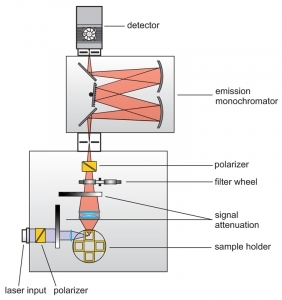 A classical spectrometer set-up is used to study singlet oxygen. The sample is excited by a pulsed or cw laser and the fluorescence is collected in the usual 90° angle orientation. 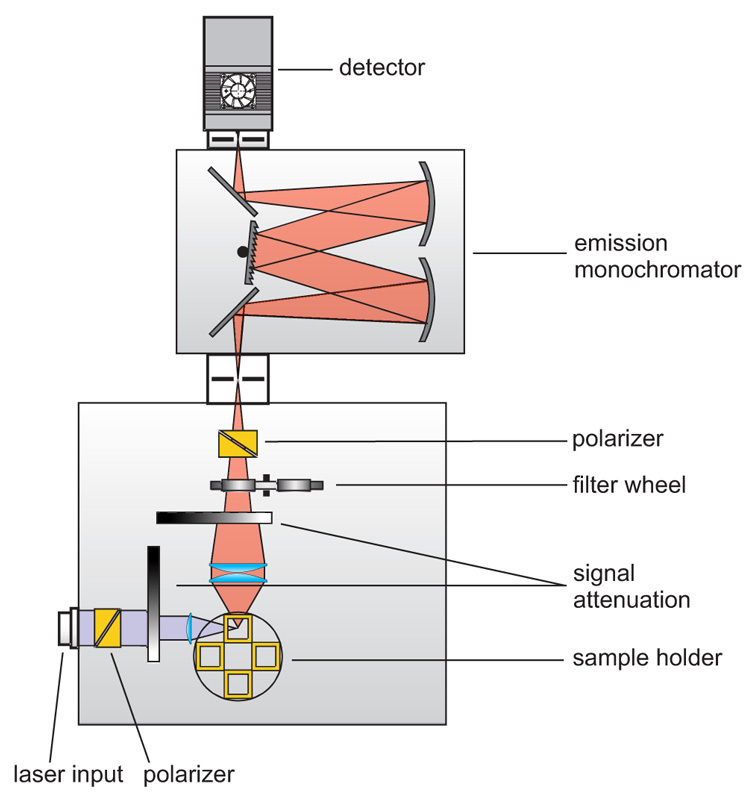 The emitted fluorescence is filtered by means of a monochromator or optical filters and detected using a NIR sensitive detector. For lifetime measurements, either Time-Correlated Single Photon Counting (TCSPC) or Multi-Channel Scaling (MCS) is used for data acquisition. The FluoTime 300 “EasyTau” is a fully automated, high performance fluorescence lifetime spectrometer with steady-state and phosphorescence option. 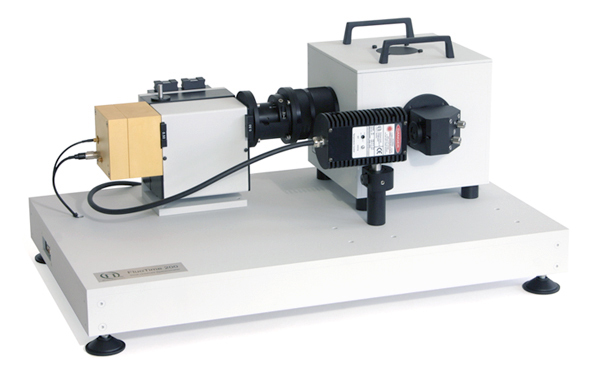 The system features an ultimate sensitivity with a record breaking 24.000:1 Water Raman SNR. 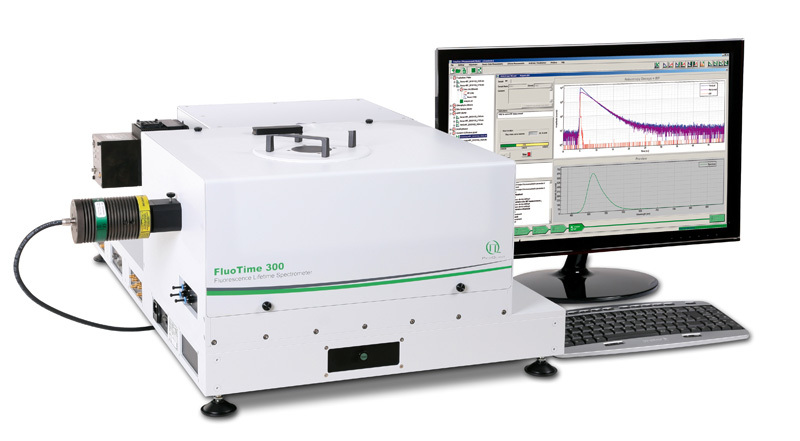 The FluoTime 300 contains the complete optics and electronics for recording fluorescence decays by means of Time-Correlated Single Photon Counting (TCSPC) or Multichannel Scaling (MCS). The system is designed to be used with picosecond pulsed diode lasers, LEDs or Xenon lamps. Multiple detector options enable a large range of system configurations. The FluoTime 300 can be used to study fluorescence and phosphorescence decays between a few picoseconds and several seconds. The FluoTime 250 integrates all essential optics and electronics for time-resolved luminescence spectroscopy in a compact, fully automated device. This spectrometer is designed to assist the user in carrying out routine as well as complex measurements easily and with high reliability thanks to fully automated hardware components and a versatile system software featuring wizards providing step-by-step guidance. The FluoTime 200 spectrometer is a high performance fluorescence lifetime system featuring modular construction, single photon timing sensitivity and research flexibility. It contains the complete optics and electronics for recording fluorescence decays by means of Time-Correlated Single Photon Counting (TCSPC). The system can be used with femtosecond or picosecond lasers. With the FluoTime 200, decay times down to a few picoseconds can be resolved. The figure on the left shows the steady-state spectrum of the singlet oxygen emission produced by H2TTPS in acetone and even in H2O, which is especially challenging due to the spectral overlap of water and singlet oxygen emission. The graph on the right additionally shows the time-resolved singlet oxygen measurement using the burst mode feature of the FluoTime 300, i.e. first multiple laser pulses are used to deposit energy into the sample and then the excitation is stopped long enough to capture the comparably slow decay of the sample. A tail fit yields a lifetime of 3.4± 0.3 µs, which is in excellent agreement with the published literature value.